Gently blend stir all ingredients together. Flavors are better if you make this a day before you need it. WARNING! : This is VERY garlicky tzatziki, so garlicky that’s it’s “hot”. If this thought frightens you (or those that live with you), feel free to cut back on the garlic amount to your taste. Saute onion and garlic in olive oil until soft. Combine chickpeas, garlic, onion, coriander, cumin, salt, pepper and 1/2 cup of garbanzo flour in medium-sized bowl. Mash with a potato masher into a smooth, thick paste (use blender or food processor, if you prefer). Scoop paste out with a large spoon, about 1/4 cup at a time, and form into small balls, about 1 and 1/2 inches across, then flatten them slightly into “cakes”. 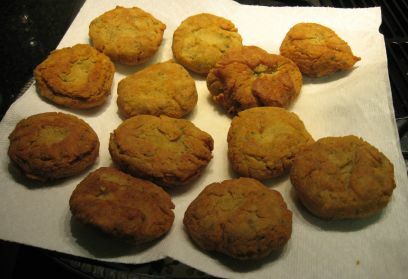 Dredge them, one at a time, in the remaining 1/2 cup of garbanzo flour. 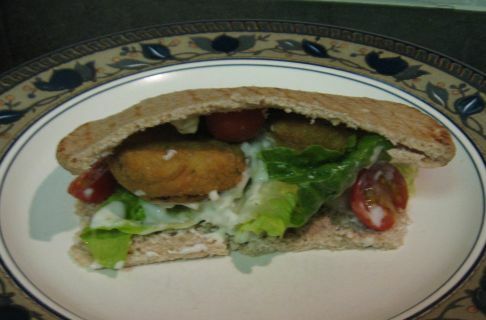 Fry falafel patties in about 2 inches of canola oil until golden brown (2-5 minutes), turning once. (I actually should have cooked the ones in the photos a few minutes longer, so cook yours until they’re a little darker.) Drain on paper towels. Makes about 12 falafel patties. NOTE: If you can’t find garbanzo bean flour, or just don’t want to mess with it, you can drain the liquid from the garbanzo beans and just omit the garbanzo flour. If you still can’t reach the right “pasty” consistency, you can add just enough regular all-purpose flour to reach the right texture. Cut an inch or so off one edge of pita bread and gently open to create a pocket inside (mine tore a little – sometimes microwaving the bread for 15 -20 seconds, wrapped in a damp paper towel, helps to soften it). Gently place some romaine lettuce leaves and tomatoes inside. Add 2 or 3 falafel, then spoon in the tzatziki. Have lots of napkins on hand! Yum, yum, yum! When I saw this recipe in this month’s issue of Food & Wine, I knew that I HAD to try these! How could I pass them up – chocolate, pecans, caramel? Mmmmm….. and the recipe is from a local cook, too! We are going camping next week for Spring Break (much more on that later), so I thought that it would be fun to bring a batch of these along with us for snacking. Yummy! 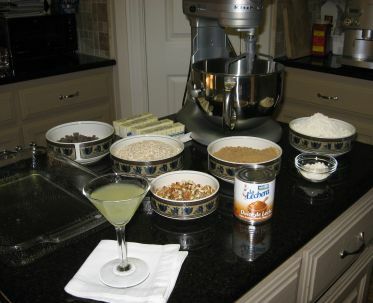 Mise en place for Carmelitas – YES, the gimlet is necessary. 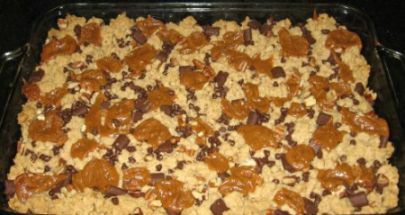 Baked Carmelitas, resting in the pan. 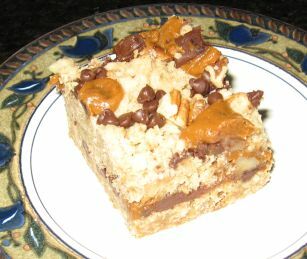 I used a mixture of semi-sweet chocolate chunks and mini chips, because that’s what I had on hand. 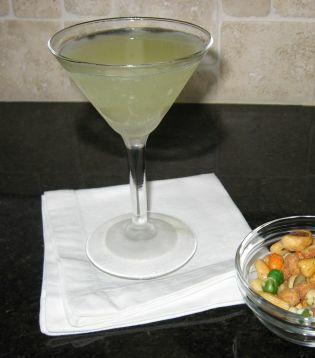 Lime Basil Gimlet, frosted glass, salty snacks…..it just doesn’t get much better. I have a great mini loaf pan that makes 8 mini loaf shapes, each about the size (or maybe a little bigger than) a standard muffin pan. Boy and Girl love it when I make their favorite banana muffins in this pan, but it’s also great for individual meat loaves. They cook much quicker than a standard bread pan meatloaf and there’s no slicing required! Preheat oven to 350 degrees. Saute onion and garlic in olive oil until soft. Gently mix onion and garlic with beef, eggs, oats, steak sauce, herbs and salt and pepper. Press into 8 mini-loaf tins. Mix remaining glaze ingredients (ketchup, remaining garlic clove, brown sugar, mustard powder) and gently spread over top of meat loaves. Bake at 350 degrees for 40 – 45 minutes or until internal temperature reaches 160 degrees. Let meatloaves sit for 5 minutes before removing from pans to serve. 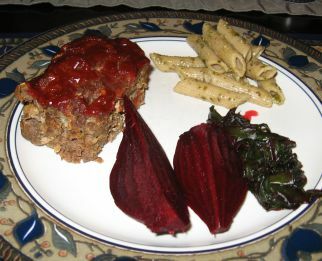 For a full-sized meatloaf in a regular loaf pan, bake for 60 – 90 minutes or until internal temperature reaches 160 degrees. Let sit for 10 minutes before slicing and serving. 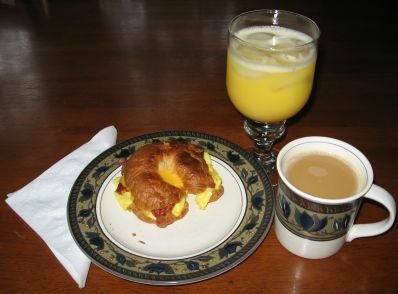 Mmmm…… Croissant sandwich with egg, bacon and cheese. You can figure out how to do it yourself, but trust me, it’s yummy. My delayed response to the woman at the hair salon yesterday, whose addition to our discussion of hybrid cars was “I just want to “live large” in my SUV and not think about about it”: You are an idiot. I hope that your cute hairstylist gets tired of covering up your gray and runs you over with her new Prius. Best Friend and I went to Jacksonville, Florida last weekend for some “Girls’ Weekend” R & R. It was a lot of fun and it was great to catch up (she lives 1500 miles away). We spent the first night with some dear friends of hers who are charming hosts. They made us a delicious dinner of chicken with artichokes and sun-dried tomatoes and wonderful breakfast. They weather was a little chilly, drizzly and cloudy while we were there, but we had a great time, anyway – the hotel bar made GREAT, spicy Bloody Marys and there was a Starbucks IN THE HOTEL – what more could you ask for? We spent some time at a spa, having things polished and waxed and ate lots of great food (mmmm….seafood). 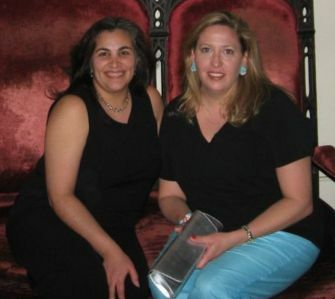 We went on a “Ghost Tour” in St. Augustine one night, too – spooky! We had a fabulous dinner of tapas at the Columbia Restaurant in St. Augustine. Their mojito is the best I’ve ever had, their black bean cakes were scrumptious and they had some mussels with chorizo that were AMAZING. I think I’m still in a “Spanish” kind of mood, still dreaming of my favorite show, “Top Chef” and winner Ilan Hall’s Spanish bent. There is a huge feature on him in this month’s Food & Wine magazine. I can’t wait to try his recipe for Fideo Cakes with Shrimp and Chorizo. I attempted to copy the artichoke chicken recipe for dinner last night. The recipe was originally from a package of Knorr French Onion soup (recipe here), but I adapted it quite a bit to try to eliminate a little salt and fat. Preheat oven to 350 degrees. Place tomatoes in chicken stock to soak and soften. If they don’t soften quickly enough, microwave them for one or two minutes (in the stock). Lightly spray baking pan (approx. 13 X 9, or slightly smaller) with cooking spray. Place chicken in pan and lightly season it with salt and pepper. Saute onion in olive oil over low heat, stirring gently and frequently, until onions are softened and very lightly browned. Gently fold together garlic, herbs, artichokes, softened tomatoes (with stock) and browned onions. Place a mound of this mixture on top of each chicken breast and bake for 20 – 25 minutes, or until chicken breasts are thoroughly cooked. Boneless, skinless chicken breasts, instead of the bone-in ones. Dry tomatoes, instead of oil-packed. Water-packed artichoke hearts, instead of the ones in marinade, adding herbs for flavor. I think all of the substitutions were OK, except for the dry tomatoes. There is just nothing that can substitute for the chewy texture of the oil-packed ones. Mine tasted fine, but were too soft. 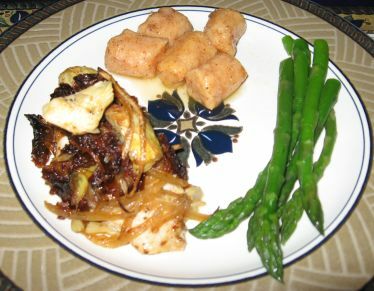 This recipe was VERY easy and a really big hit with me and Hubby. Boy and Girl liked it, too, but Boy ate the artichokes and Girl ate the tomatoes – no big surprise there.